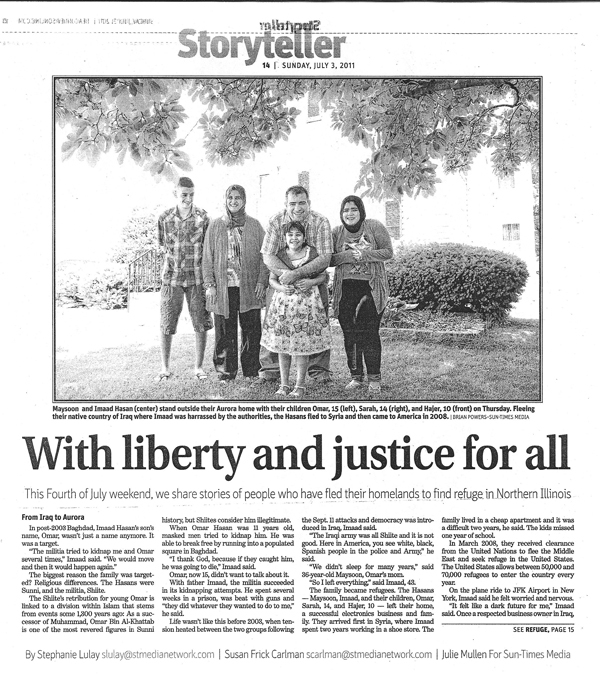 Stephanie Lulay’s story below features the Hasan family, one of the “graduates” of Bryan House, an organization founded by Rick and Desiree Guzman and focused on breaking poverty cycles for refugee families. The Hasan’s were also featured on an NBC news report. As Bryan House grew and extended its programs to all the working poor, it became part of a larger organization, Emmanuel House. In 2016 Emmanuel House was named one of the “Top 100 Most Innovative” social change organizations in the world. In post-2003 Baghdad, Imaad Hasan’s son’s name, Omar, wasn’t just a name anymore. It was a target. The biggest reason the family was targeted? Religious differences. The Hasans were Sunni, and the militia, Shiite. The Shiite’s retribution for young Omar is linked to a division within Islam that stems from events some 1,300 yeasrs ago: As a successor of Muhammad, Omar Bin al-Khattab is one of the most revered figures in Sunni history, but Shiites consider him illegitimate. When Omar was 11 years old, masked men tried to kidnap him. He was able to break free by running into a populated square in Baghdad. “I thank God, because if they caught him, he was going to die,” Imaad said. Omar, now 15, didn’t want to talk about it. With father Imaad, the militia succeeded in its kidnapping attempts. He spent several weeks in a prison, was beat with guns and “they did whatever they wanted to do to me,” he said. Life wasn’t like this before 2003, when tension heated betwen the two groups following Sept. 11 attacks and democracy was introduced in Iraq, Imaad said. “The Iraqi army was all Shiite and it is not good. Here in America, you see white, black, Spanish people in the police and Army,” he said. “We didn’t sleep for many years,” said 36-year-old Maysoon, Omar’s mom. “So I left everything,” said Imaad, 43. The family became refugees. The Hasans—Maysoon, Imaad, and their children, Omar, Sarah, 14, and Hajer 10—left their home, a successful electronics business and family. They arrived first in Syria, where Imaad spent two years working in a shoe store. The family lived in a cheap apartment and it was a difficult two years, he said. The kids missed one year of school. In March 2008, they received clearance from the United Nations to flee the Middle East and seek refuge in the United States. The United States allows between 50,000 andc 70,000 refugees to enter the country every year. On the plane ride to JFK Airport in New York, Imaad said he felt worried and nervous. “It felt like a dark future for me,” Imaad said. Once a respected business owner in Iraq, all he knew about America was what he had seen in John Wayne movies. The Hasan family spent a week with a host family, then were placed in an apartment by World Relief Aurora. The children received English lessons and both parents started working. Imaad is now a machine operator and Maysoon is a cafeteria cashier at Jefferson Middle School in Aurora. Through Bryan’s House [sic], a non-profit that helps refugees save and work their way out of poverty, the pair was able to save $12,000 toward the down payment on their first U.S. home on Aurora’s West Side. That down payment was matched by various grant programs, according to Rick Guzman, co-founder of Bryan’s House [Read about Bryan House and Emmanuel House below]. Next year the family will apply for U.S. citizenship, although Maysoon said she missses her family dearly. “When we first arrived here, we had this idea that we’d go back,” Imaad said. But he isn’t sure it that place exists now. Baghdad, an ancient city, is now “a garbage city,” Imaad said. “Here, we have our freedom,” Omar said. This article goes on to profile two other refugees: Sahr Kanjama from Sierra Leone, and Aloune Khotisene from Laos. ♦ Go to the Emmanuel House /Bryan House main page on this site. Below, Lulay’s article as it looked in the paper on July 3, 2011. Go here for journalist/photographer Peter Hoffman’s portrait of Imaad. This entry was posted in Social Change and tagged Baghdad, Bryan House, Emmanuel House, freedom, Iraq, Iraqi militia, refugees, Stephanie Lulay, Sunni-Shiite conflict, U.S. refugee policy. Bookmark the permalink.